Larry Geni (pronounced JEE-nee) is a career-long, passionate educator and founder of Geni Consulting, a firm dedicated to transforming classrooms into dynamic communities of self-directed learners. In his more than 25 years as a high school science teacher, he developed a unique approach to education that teaches students to take ownership of the learning process and creates a classroom culture grounded in the personal growth and academic success for every student. (For more on the philosophical basis of this approach, see Credo, below.) This approach has proven successful in a wide range of disciplines and academic levels, from Title I Algebra to Advanced Placement Psychology. After retiring from the classroom in 2010, Larry has dedicated himself to disseminating this approach as widely as possible. He has worked as an educational consultant supporting teachers, running workshops, and giving presentations at national education conferences, school in-service sessions and other groups of teachers. You can see his resume below. He has also written two books on the subject, both of which are available in their entirety on this website. 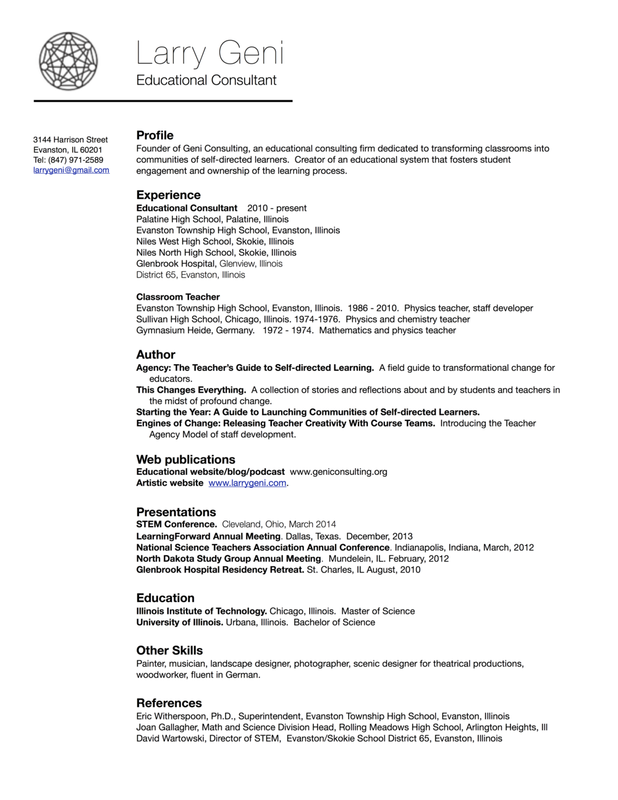 The first, Agency: A Teacher's Guide to Self-directed Learning, serves as a guide for teachers on implementing the philosophy and strategies Larry developed in his own classroom. The second, This Changes Everything, describes his experiences with his students and with the teachers he has worked with as a consultant. Larry lives and works in Evanston, Illinois with his wife, Nancy. He is inordinately proud of his daughter Abby, his son Joe, his son-in-law Scott, and especially, his grandson Milo, who is only 5 and doesn't have a website yet. In addition to his educational work, Larry is a visual artist, specializing in oil on canvas landscapes, drawings, photography and theatrical set design. You can view his artistic work at www.larrygeni.com. The purpose of school is to prepare students to live satisfying, productive, and engaged lives. We must focus not just on what students should know and be able to do, but in who they become in school. As important as thoughtful curriculum and excellent teaching are, we have to remember they are both means to an end. The focus must remain on the learner and how she can become a responsible, self-reliant agent who steers her own learning process. Ideally, schools should foster creativity, grit, self-directedness, the willingness to make mistakes and to learn from them, and skill at collaborating with others. These traits are essential to learning effectively; more importantly, they are essential to living well. Focusing these traits helps fulfill the human potential of students and teachers alike. Nurturing these attributes requires a shift in the role of students in school, and therefore a shift in the role of teachers. It requires a classroom culture dedicated to genuine learning and personal growth, one in which the all-too-common student posture of going through the motions of “doing school” is relentlessly challenged. Participating in a community of learners dramatically improves the depth and breadth of learning taking place. It also generates a sense of trust and belonging that are the basis for personal growth. Great education is a realistic goal. It works with students as they are, not as they should be. It is responsive to the needs of each student and therefore optimally enhances every student's intellectual and personal growth. It can be accomplished in existing schools, with existing teachers and students. It won’t require billions of dollars or high-stakes testing. Instead, it simply requires a change in the way we think about school. I deeply loved being a classroom teacher, in large part because the ideas described in these books liberated me and my students from many of the commonplace struggles and problems. We came to find school more meaningful, more exciting, and more effective than we thought it could be. It is my hope that the words you read here will help you redefine your practice and give you and your students some of the life-altering experiences that I shared with my students.